The interior of the future home of Thrive Wellness and Weight Management will resemble a “playground for grown-ups,” says owner Virginia Kramer. The fitness and weight loss center is moving out of the space it shares with Impact Physical Therapy, across the street from Three Rivers Community Hospital, and plans to open its new location in a building at 1550 Nebraska Ave., formerly the home of Cartwright’s Valley Meat Co. The space is three times the size of Thrive’s current home, and it is expected to be open by the end of September. “The equipment inside the new location is going to be unlike any other local gym,” Kramer said. She described childhood activities including monkey bars and a climbing rope, in addition to room for boot camp exercises and traditional equipment such as dumbells, stability and water balls and cable machines. For members such as Lance Baker, the new location will provide more room where Kramer and her staff of personal trainers can help more people. “She’s kind of been limited on how much she can expand and now, going to the new building is exciting so she can branch out and help more people,” Baker said. Baker first came to the center in January for weight loss assistance and has since lost nearly 50 pounds. He works out there five to six days a week. In the new location hours will be expanded to 5 a.m. to 9 p.m. Monday through Friday and 7 a.m. to 1 p.m. Saturday. Sunday hours have not yet been determined. “It’s going to be 7,200 square feet of fun and games,” Kramer said. In remodeling the interior, Kramer worked with a number of local contractors, including Grants Pass-based Cabinet Crafters, Central Point-based Pro-Tec Painting, Caveman Heating in Grants Pass, and Affordable Telephone in Williams. The interior will have pear-colored walls with maroon stripes, a new air conditioning system and matted-rubber flooring. 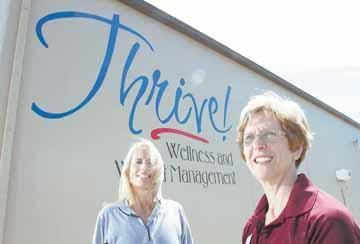 At Thrive Wellness and Weight Management, the program is different from the typical gym, Kramer says. Her staff of certified personal trainers are there during operating hours to provideguidance and tips to clients. “Where most clubs are self-serve, we’re the opposite,” Kramer said. “When someone comes into exercise on their own, they often times don’t know what to do and don’t have a good, solid, balanced plan. Kramer said the new location will offer synergy treatments for cellulite, massage therapy, and classes such as Zumba, yoga and boot camps. Co-owners Erin Houk, left, and Virginia Kramer are transforming the old Cartwright’s building into Thrive Wellness and Weight Management.